The annual Business Traveller Airline Survey has revealed how much space passengers get when they fly, across every cabin class. Here is our pick of the results. Budget carrier Ryanair has the narrowest economy seats out of the 32 airlines surveyed, offering just 16 inches of width, with Air Canada’ seats the widest at 18 to 18.5 inches. Asian carriers Cathay Pacific and Singapore Airlines offer the most legroom in economy, with 32 inches across their fleets, while ANA offers between 31 inches and 38 inches, depending on the aircraft. British Airways’ sister airline, Iberia, offers the least legroom with just 28 inches on its A319s and A320s. However, just over half of Iberia’s planes have 30 or 32 inches of legroom. Easyjet comes in second-to-last with 29 inches of legroom across its fleet. Flag carrier British Airways came in eighth for width (between 17.3”-18.1”) but only 21st for legroom (30 to 31 inches). Rival carrier Virgin Atlantic did better on both counts – in fourth place for width at 17.5 inches, and joint tenth (with Kenya Airways and United) for legroom at 31 to 32 inches. The premium economy products on both British carriers offer the same amount of legroom, at 38 inches, while Turkish Airlines’ premium economy product offers the most space at 46” of legroom. When it comes to width, Cathay Pacific wins with 19.5 inches of space, and Virgin Atlantic loses, with 17.5 to 21 inches. According to the survey, Virgin Atlantic has the longest fully-flat business class bed in the sky at up to 87 inches, with Thai Airways and Jet Airways the shortest at 63.5 inches. But it should be noted that Cathay Pacific comes out top when taking the longest minimum measurement for length – with a range of 81 to 82 inches. British Airways’ business class bed is in 16th place, with the length ranging from 72 to 78 inches. Only four airlines are fitted with enclosed suites in first class – Emirates, Etihad Airways, Singapore Airlines and Jet Airways. See below for the complete rankings. Business Traveller collated and checked more than 8,000 individual items of data from 32 airlines for the airline survey, which is published as a supplement alongside the November edition of the magazine. To subscribe to the print magazine, click here. 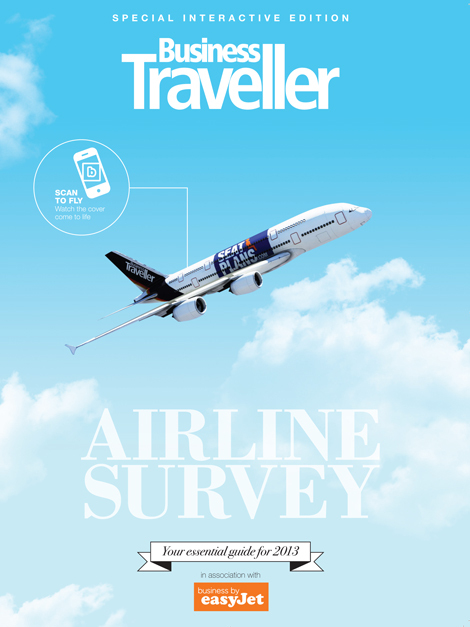 Business Traveller and the accompanying survey are also published in digital format – for more information click here. This month’s Business Traveller magazine also features interactive augmented reality content – to see a 3D version of our Business Traveller and seatplans.com-branded aircraft on the cover image at the bottom of this article, download the free Blippar app and scan the image. The results of the annual survey have already been picked up by the Daily Mail in both print and online. For more information visit seatplans.com. How much legroom do you get in economy? Which airlines have premium economy class and how much legroom do you get? Which airlines have premium economy class and how much width do you get? Hoxton brand set for chain rollout?